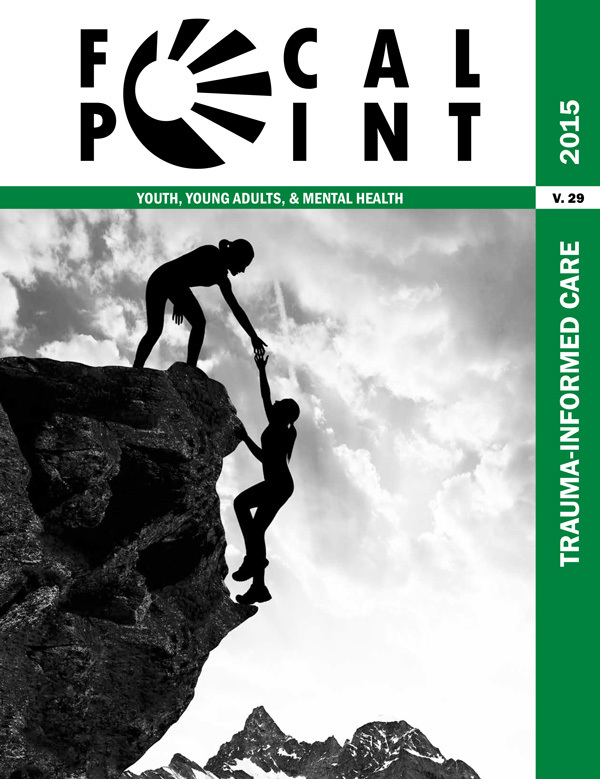 This issue of Focal Point focuses on trauma–informed care and its growing relevance in research, official policy, practice methods, and organizational structure. The introduction to this issue ofFocal Point highlights a variety of perspectives that examine the effects of trauma, the need for trauma–informed care, and how these methods can be incorporated into organizational culture and policy. A sexual assault survivor explains how the power of artful expression transformed her personal interpretation of trauma and enabled healing reflection through nonverbal communication. This primer explains the neurobiological effects of toxic stress in the brain and the detrimental outcomes that psychological trauma can have on the development of both mental and physical health in young adults. Data Trends: Can the Body Help Reduce Adolescents’ Trauma Symptoms? This segment of Data Trends describes how therapies involving sensory movement may help reduce the symptoms of trauma in youth who have been previously unsuccessful with traditional talk and symbolically–based therapies. This article spotlights the influence of toxic stress on behavioral regulation and emphasizes the necessity of a trauma–informed relationship between young adults and their service providers. This article examines the difficulties that transition–age youth with complex mental histories are poised to face without the life skills, long–term services, and supportive networks needed to function successfully in adulthood. One mother describes her son’s traumatic encounters with racism, biases, and racial profiling while seeking mental and physical health care services. This article expands on the need for trauma–informed collaboration with youth and their critical participation in planning, reforming, and implementing successful organizational services aimed towards young adults. This piece analyzes the policies affecting trauma–informed care and their influence at the agency, program, employee, and practice level. This article clarifies SAMHSA’s approach to trauma–informed care and offers guidance for implementing a trauma–informed approach through key principles, philosophies, and procedures. Focal Point's final article provides an overview of trauma–informed methodologies and addresses the multiple domains, systematic approaches, and potential problems new organizations are advised to consider.